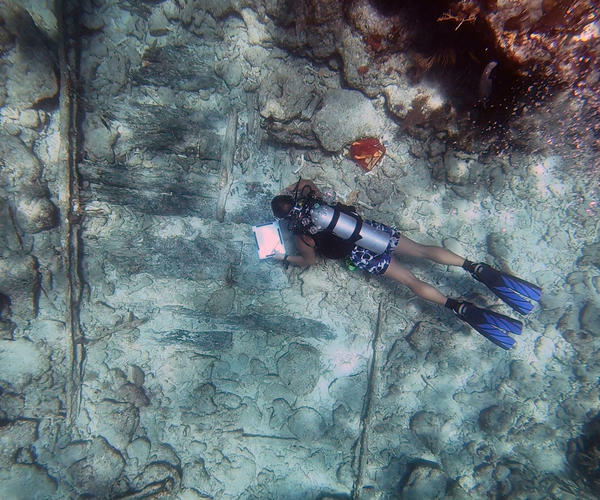 A volunteer from Diving With A Purpose records data from a shipwreck exposed by Irma in the Upper Keys. While the reefs of the Lower Keys took a harder hit from the storm, it also had an effect on the Upper Keys reefs, said Brenda Altmeier, maritime heritage coordinator for the Florida Keys National Marine Sanctuary. “There was as much as three feet of sand that was taken off in some areas of the reef line up by Molasses Reef so it left a lot of things uncovered that had been covered for years,” she said. Among them was wreckage that many locals assumed for years was material from the Overseas Railway, which ran along the Keys from 1912 until 1935. But researchers say it’s not railroad material — it’s from a ship, most likely the Slobodna. 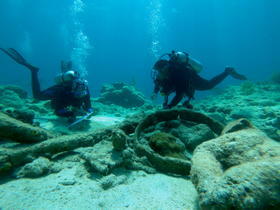 That ship ran aground at Molasses Reef in 1887 while carrying cotton from New Orleans to Estonia. “The particular wreckage that we’re working on now has similar features to the vessel that was noted as being lost - a composite-built shipwreck. We know the Slobodna was composite-built. It had iron frames and wood siding,” she said. Irma uncovered more of the pieces that match the Slobodna. The sanctuary has been working with 33 divers from the nonprofit Diving With A Purpose to map the materials on the seabed. The project includes three days of diving on the site, then returning to the lab to take drawings made underwater and make them into a detailed site plan. The goal is to have a detailed site map on the sanctuary web site that will help inform and guide divers at the popular Upper Keys reef. She said the work wouldn’t be possible without the volunteer group, which is a spin-off from the National Association of Black Scuba Divers. “They bring a lot to the table enhancing our understanding of our world underwater here and our involvement in history over time,” she said.